“Imagine a world where the evaluative power of millions of smartphone users is harnessed to rate their immediate environment, from which a global, dynamic map is generated. A further aim of our service is to generate a global, crowd-sourced early warning system of damage and catastrophes”. The scope of the system is wide-ranging. It may be used commercially in housing or holiday area selection, or in more fundamental real estate investments in green areas or town planning as a means of assessing the quality of the natural environment. Or a tourist in a new destination may simply wish to choose the most interesting and beautiful route to cycle down. The initial concept arose from the idea that: if hotels and restaurants are graded for their internal environment, could the outdoor environment be graded and receive a rating in the same way? Would this in turn lead to a similar result, whereby the interest in experiencing and adding one’s own rating adds perceived benefit to the experience, whilst also drawing renewed attention to the environment? From the point of view of the rater, awarding points for their natural environment opens their eyes to the state of the natural and living environment. Seen through the filter of environmental assessment may stimulate an enhanced view of even their own home town, and engender comparison with other towns and cities globally. Well-cared for spaces in the built environment become easy to differentiate. The CityRating (KaupunkiReittaus) campaign in Finland’s largest towns and cities awards points in summer. Environmental destruction will however reduce the attractiveness of places and the cost of environmental crimes may therefore increase in this respect. “People are worried when they read about environmental destruction. They are also concerned with how nature can be experienced in an authentic way and how to care for it. Our service makes the care of the environment completely transparent. The system’s dynamically updated colour map signals when the care of a natural environment is headed in the wrong direction. We are raising the appreciation and maintenance of the natural environment back to where it has traditionally been, as a vital part of daily life…” confirms Dr. Harju-Autti. Increased environmental awareness due to education and current alarming trends of global environment, coupled with the continued explosive rise in smartphone use has a great potential to generate a large user base for Envirate. 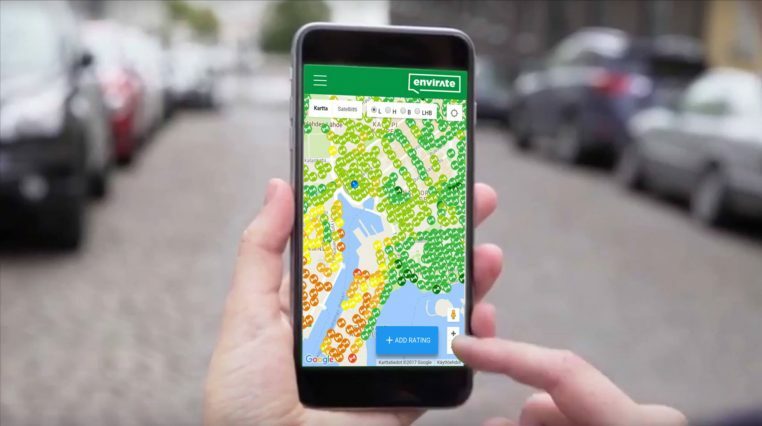 The goal for 2020 is to have 100 million users and for Envirate’s dynamic environmental maps to cover 95% of the globe. Dr. Harju-Autti is clearly excited by the capabilities of the team he has gathered. For example, Envirate’s userbase expert, Mika Vanhanen, has already constructed a global network of 10,000 schools that have planted over 20 million trees in 160 countries. Even at this stage Envirate already has a potential userbase of 100,000 individuals. Furthermore Dr. Harju-Autti’s recent doctoral dissertation at the University of Oulu entitled “Environmental awareness compared between states, and environmental world-views at the individual, organisational, and political levels” is the first published piece of global, comparative research on environmental awareness. By using the Envirate app, the research topic realised its goal whereby any individual with access to the internet can assess their immediate environment. The quality of comparisons of user-generated environmental status far exceeded expectations. “Finland is a global leader in environmental awareness, as in innovation. We possess a wealth of beautiful nature. Green innovation capabilities are high in Finland too; therefore it seems natural that such an idea would arise here. The future of the environment shows many positive signs of recovery and we wish to reinforce this development. We will create in many places of the world the desire to improve conditions. From this we hope to stimulate more environmentally-aware methods of living and modes of tourism that are more interested in unspoilt nature. And above all, to care for our planet.” – Dr. Harju-Autti.